ISKCON Scarborough: ISKCON Scarborough - The Holy Month of Damodara has started! ISKCON Scarborough - The Holy Month of Damodara has started! The holy month of Karttika(Damodara) started yesterday - 25th Oct 2018 (Thursday) and ends on 22nd Nov 2018(Thursday). Srila Rupa Goswami, in his Sri Utkalika-vallari, proclaims Radharani as Kartik-devi, the goddess of Kartik. First is Radha, then Krishna. Therefore, we say "Radha-Krishna", "Radha-Shyam" or "Sita-Rama". Krishna's Sakti always comes first and is always glorified as the dearest to Krishna. We approach Krishna through Radha, who also represents the greatest devotee of Krishna. In the Adi-Purana it is said: "My dear Partha [Arjuna], one who claims to be my devotee is not so. Only a person who claims to be the devotee of my devotee is actually my devotee." So during this month, we can more easily obtain the favour of Smt Radharani. If Smt Radharani recommends us to Krishna, we can be sure he will take notice. 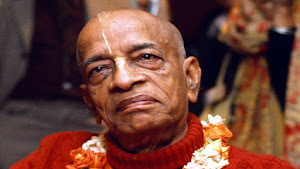 Srila Prabhupada- Sept 18,1969, London: Radharani is Hari-Priya, very dear to Krishna. So if we approach Krishna through the mercy of Radharani, then it becomes very easy. 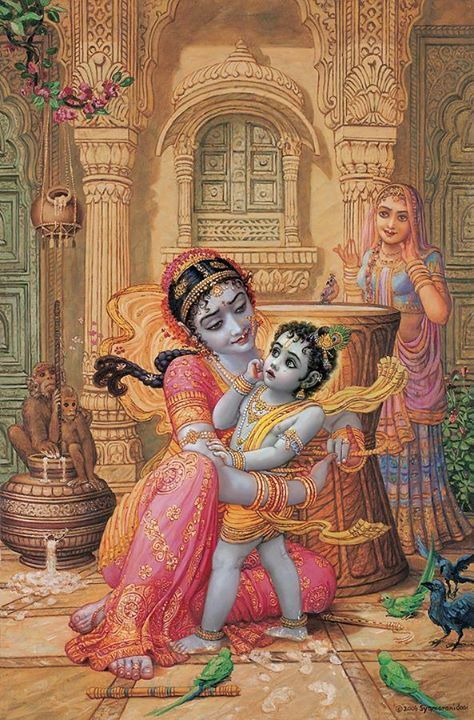 If Radharani recommends that, "This devotee is very nice," then Krishna immediately accepts, however foolish I may be. Because Radharani recommends it, Krishna accepts. Therefore, in Vrndavana, you'll find all the devotees chanting Radharani's name more than Krishna's. Wherever you'll go, you'll find the devotees are addressing one another, "Jaya Radhe." They are glorifying Radharani. They're more interested in worshipping Her. This is because however fallen I may be, if somehow or other I can please Radharani, then it is very easy for me to understand Krishna. In this endeavour, there is no loss or diminution, and a little advancement on this path can protect one from the most dangerous type of fear. Such is the benefit of devotional service in general. However, during the month of Damodar, or Karttika rewards for service to Krishna are greater than at any other time of year. • When one offers a lamp during the month of Karttika, his sins of many thousands and millions of births perish in half an eye blink. • Even if there are no mantras, no pious deeds, and no purity, everything becomes perfect when a person offers a lamp during the month of Kartika. • A person who during the month of Karttika offers a lamp to Lord Keshava has already performed all yajnas (sacrifice for the pleasure of the Lord) and bathing in all the Holy rivers. • The ancestors say "when someone in our family pleases Lord Keshava by offering Him a lamp during the month of Karttika, then by the mercy of the Lord who holds the Sudarshan-Chakra in His hand, we will all attain liberation. • To one who either at home or in a temple offers a lamp during the month of Kartika, Lord Vasudeva gives a great result. • No sins exist anywhere in the three worlds that will not be purified by offering a lamp to Lord Keshava during Karttika. 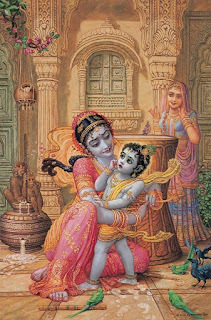 • A person who offers a lamp to Lord Damodara during Karttika attains the eternal spiritual world where there is no suffering. As quoted in the Sri Hari Bhakti Vilasa, "In the month of Kartika one should worship Lord Damodara and daily recites the prayer known as Damodarastaka, which has been spoken by Sage Satyavratra and which attracts Lord Damodara. (Sri Hari Bhakti Vilasa 2.16.198)"
Observing the Kartika Vrata or Urja vrata as it also called, is glorified in the Vedic scriptures.